Warning Noob alert !. – Dirty wet dog , boats and sailing. The fun of writing i find is the ability to tell stories, doesn’t have to be War and Peace to put something across and the discipline of doing it is to get an idea, think about that and work on it while doing something else : i for example often ‘speak’ mine in the car while i am wasting the half-hour driving to work, then, when i have the basic idea i sit here at the desk and tap it out. It often then needs an edit because i never learnt the proper discipline of grammar and syntax….even though i at least started out at a grammar school. The fun is in the story and being a storyteller and i think some of the best stories are when the writer, me in this case. becomes the fall-guy and i have been there many a time. I am starting a longer series of posts soon where i am going to concentrate on something i really like and that is boat interiors : not in a ghey ‘house and garden’ style of over done ‘designer’ dreck that we see nowadays but boat interiors that will actually work at sea and at anchor, somehow look right and work well. I was reminded of this strongly last year at the Eric Tabarly museum where Pen Duick 3 was alongside and inside the museum is a full size mock-up of the centre section of Pen Duick 2 with Tabarly’s canting chart table and motorcycle seat. That boat was designed by a master and a seaman and it shows !. I was also reminded of functional but beautiful interiors when i saw the Waarschip : it all looks as though it would be functional, comfortable and safe in a seaway and looks great too. The other boat i was trying tom find to illustrate this is a restored folkboat and they are boats without much of an interior but what they do have often doesn’t work…this one does. I was thinking about that boat when i also went mentally sideways back to my first boat : a very rough east German Folkboat but where even then i had an idea what i was trying to achieve inside a boat. Here by the way is the kind of thing i would love to achieve with video : find a boat an let its owner talk, the boat does the rest. My folkboat was nothing like this nice, most of the ribs were broken, it had been spoiled with an engine (folkboat doesn’t need an inboard) had a high and ugly cabin and had more problems and ‘issues’ than the average SJW but hey…it was my first boat. Psychologist Jordan Petersen makes some very interesting observations about what is ‘us’ and what isn’t, bear with me on this as it gets a bit strange at times but for example my immediate environment is an extension of ‘me’ when i alter it/adapt it according to my mental state and that happens without thinking about it much. Take for instance my garden, that is clearly an extension of ‘me’ in that you could walk past and look at it and you would see an extension of my work and my thinking, in a way my aesthetics and my state of mental organisation or lack of it. Funny but Jax and i were talking about a bloke down the road who clearly has some bad mental health problems and the outside of his cottage almost perfectly indicates his chaotic mental states. Thus the analogy is that boats ‘are’ their owners : i can look at a boat and learn something about the owner, sometimes lots about the owner. Take a look at the simplicity and perfection in detail of the folkboat and i think we also see the owner (Carol Hasse). This by the way is a gentle introduction to some themes that i am going to be exploring in the blog and for those who are interested i will post some links to Dr Petersens work : i for one spend an hour or so a day in his virtual classroom and as a result of that am being exposed to a real education in the humanities….and you thought that this was just about boats huh ? Noob story today then : is all about my first boat. The Folkboat was an all-varnished East German boat and they are possibly the worst of the folkboats in that the basic idea was spoiled with an ugly cabin and doghouse and an un-necasary internal engine (petrol btw)…mine would only run on one tack !. I knew very little about boats when i bought that boat and as a direct result of that spent a fair bit of time aground and on my side in the menai straits…one time right outside the yacht club which of course the blazer clad and chinless wonders just loved !. At that time i was of course a newbie and yes there is a hell of a lot for the tyro to take in and master in difficult and narrow tidal waters while still learning the very basics of the art. The NOOB side though is something completely different : that occurs when we haven’t applied simple thinking and logic to a problem or just haven’t thought about the consequences of some action or other. 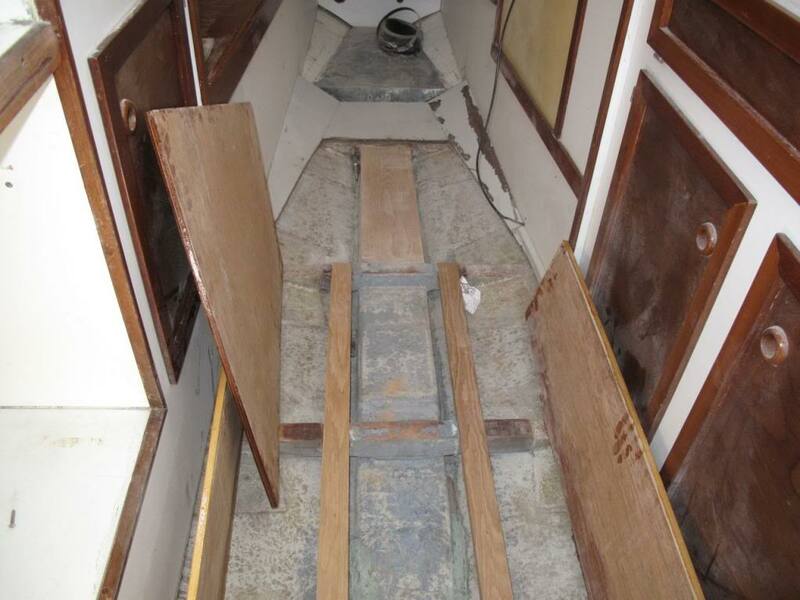 My first really great one came when i was stripping the varnish inside the folkboat on a warm day : i had a tarpauline over the boat because of the leaks an hadn’t thought to throw it back on this occasion. I was up in the bow slapping on nitromors paint stripper and scraping away contentedly with the radio playing, like you do, when after a couple of hours i realised that things weren’t quite right : i kept dropping the scraper, was singing like a mad person and i suddenly realised that i was possibly as high as a kite and off my tree on the paint stripper fumes….which i later learnt to be highly psycho-active (basically its nitro-methane). Now wait for it : i realised that i was pretty rough so i jumped off the boat and onto my motorbike (750 cc moto-guzzi) and rode home where i passed out and had some very odd dreams indeed. Experimented with drugs ever ? nah me neither but try the paint stripper some time. Alan : When I was building big composite stuff back when we where just learning about its use we had a large mould about probably 6 m x 4 m a radar reflector so curved, to put the release agent on and lay the thing up we had a gantry on wheels that you laid on, we had already named the release agent “Freak Out”, well half an hour laying over the mould applying said product you did not need the steps to get down ! I wonder how I survived some of the stuff we did back then mmm maybe I didn’t ! I was thinking about the time we worked on the big yellow dog : for some reason i decided to repaint the forepeak so i shut myself in there in overalls and a dust mask and hit the old stuff with a grinder with a soft disk and a powerful sander. I think it was you that came to get me for lunch some several hours later when i came out all white…something like an old advert for the ‘flour graders’ the funny part was when i took the dust mask off and sneezed….popped out a huge paint dust and snot plug out of each nostril ! I just managed to get an old copy of BSH with the help of the BSH facebook group : my XS650 based chop made the front cover back in 87. I wouldn’t mind getting a picture of my old Guzzi S3 ; it was a bit special having been tweaked by its first owner. I bet! The S3 is one beautiful-looking machine, tweaked or not. No time for reading Back Street Heroes back in ’87 unfortunately but I do remember visits to WH Smiths glancing at the barely-dressed girls draped over the various custom iron — great stuff. When I was building big composite stuff back when we where just learning about its use we had a large mould about probably 6 m x 4 m a radar reflector so curved, to put the release agent on and lay the thing up we had a gantry on wheels that you laid on, we had already named the release agent “Freak Out”, well half an hour laying over the mould applying said product you did not need the steps to get down ! I wonder how I survived some of the stuff we did back then mmm maybe I didn’t ! XS chop? My youngest has a mint TX650 1973, basket case 10 yrs ago. Glad we did not chop it, but they do make a great chopper or racing sidecar rig, bullit proof with 750 kit. GUZ, Yeah, could only afford the the honda CX and CB twins. I always wanted to do a follow-up project after the lowrider chop. Although i loved the look of it and it rode quite well (it was lighter than the original bike) i really wanted to go in a different direction and that was more like a flat-tracker heading towards streetfighter. It never happened because i disappeared off to sea for the next 6 years or so. I had a Hornet for a few years which technicaly was the best bike i ever owned except a bit too smooth . I kind of have a hankering to do another project but just don’t have the time….boats take all my spare time and i can do most of the work with them and don’t have skills like welding up bits of frame.